Energizer ENX8K (Black) 7500mAh UL listed lithium jump starter and 2.4A power bank. The ENX8K includes smart cables, these smart cables are critical for the safety of the jump starter and your car battery, the protections include; Reverse charge protection, reverse polarity protection, low voltage protection, over current protection, over temperature protection and short circuit protection! 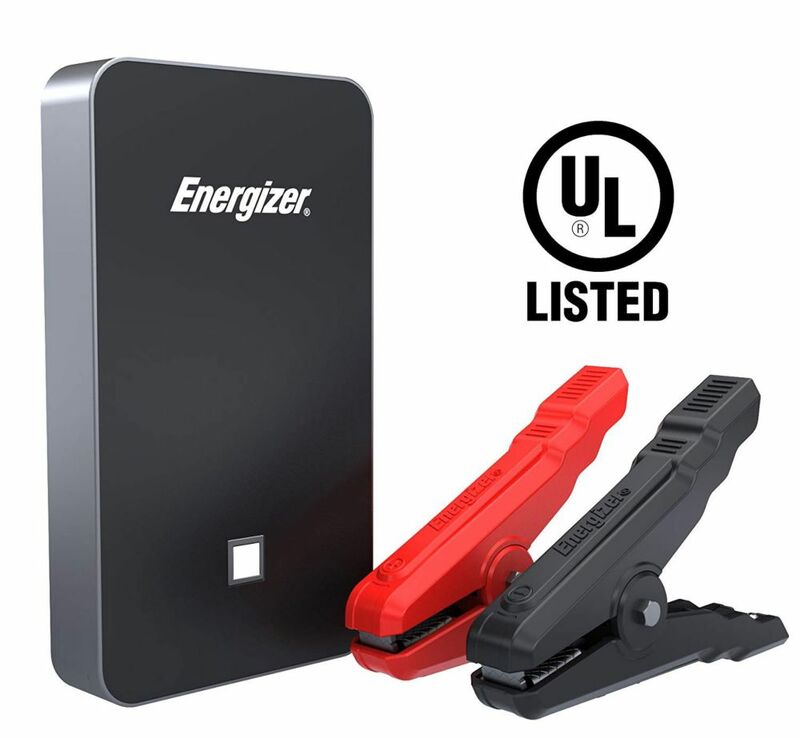 Safety is our number one concern the Energizer ENX8K jump starter is fully UL Listed, most lithium ion jump starters are built with non-approved batteries in order to save on cost. 900W Power Inverter - Get power on the GO! This heavy duty Power Inverter connects directly to a 12 Volt DC battery to power hand held power tools, televisions, gaming consoles, home electronics and small appliances in your vehicle. This unit also features an LCD display, which shows the output wattage or input voltage and battery level. With this inverter, you will never be left without power when you need it! Energizer ENB216 2-Gauge 800A 16 Foot professional series heavy duty jumper - booster cables. Ideal for all vehicle types plus full size trucks, vans and SUVs. Red/black PVC-coated insulated clamps for easy identification. Tangle-free cables remains flexible even at -400F. Heavy duty copper clad aluminum. All weather use. 7500mAh UL listed lithium jump starter and 2.4A power bank (BLACK) Energizer ENX8K (Black) 7500mAh UL listed lithium jump starter and 2.4A power bank. The ENX8K includes smart cables, these smart cables are critical for the safety of the jump starter and your car battery, the protections include; Reverse charge protection, reverse polarity protection, low voltage protection, over current protection, over temperature protection and short circuit protection! 7500mAh UL listed lithium jump starter and 2.4A power bank (BLACK) is rated 4.6 out of 5 by 11.